I’ve created a very simple online tool for converting .po and .mo files (both directions) which many WordPress developers will find useful especially when translators forget to email the original .po file. You can learn more about translating WordPress core, plugins and themes at WordPress Codex. Hello Kaspars, this is a very usefull tool and I used it to convert an .mo file to .po file, but the characters with accents ares missing in the .po file generated. Only for if is possible to resolve it for a new version. It woked fine for me when I tested Núria. Try using Poedit instead. I try to find jetpack-id_ID.po (Indonesian translation for jetpack 2.1.1) for customization, but I only found the .mo files (I can’t edit this file directly). But, with this tool I can have the *.po file! then re-create the *.mo file using poedit. Thanks a lot mate. it was really helpful to me. if you don’t mind, is that an open source tool?. if that be the case, do you want to share, how it is working. Under each tool you see the name of the linux software package that is being used for the job. 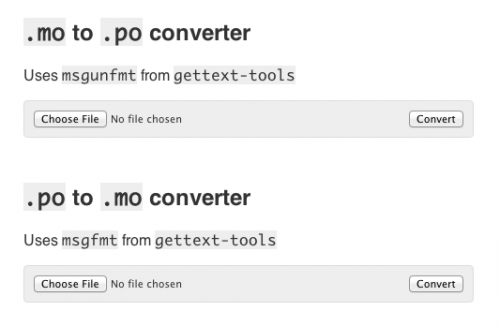 For example, msgfmt and msgunfmt from gettext-tools package are used for converting between .mo and .po files. Thanks a milion times! This helped me a lot with my modification.